I was all by myself at the start of the game up in 514. TBF was in the Shake Shack line, and so it was up to me, and me alone, to boo the opposing team’s starting lineup as it was announced. Unless we’re playing the Phillies or the Marlins or some other obvious enemy, no one in 514 seems to care enough. Of course, there was lots to boo after Denard Span hit that first home run into the bullpen. 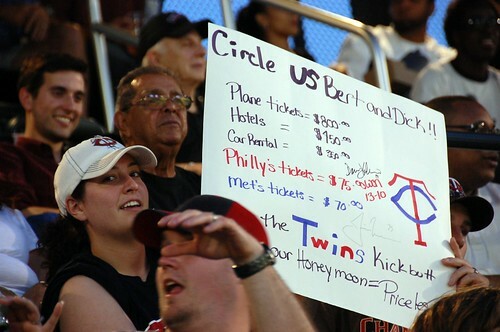 Suddenly, the Twins fans that were apparently hiding in every corner of the ballpark were standing on their feet in their hats and jerseys and “Circle Me Bert” signs, clapping. Fair enough – it was a home run by the first batter in the first inning, you can stand and clap. At least at Citi, they’re not going to get a beer poured on their head. No one was worried: I wasn’t worried, TBF wasn’t worried, the entire posture of the Promenade was one of not-worried. 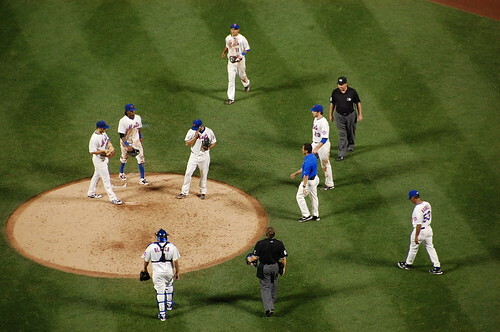 This is the 2010 Mets. The 2009 Mets might have rolled over and played dead after a first-batter first-inning home run, but not the 2010 Mets. Besides, it was Kevin Slowey. We were going to make up the difference in short order. Right? Right. Except then we experienced several innings of achieving nothing that resembled a base runner. Between every inning, yet more CIRCLE ME BERT. Some held up high, others discreetly. “If I was a stupid Twins fan, and I came all this way, I might make a stupid sign like that too,” TBF said, filling out his scorecard as though he might find some missing home runs buried in it somewhere. There was some grumbling I took to be acquiescence. Then, of course, the fourth inning arrived, and the dark cloud lifted. 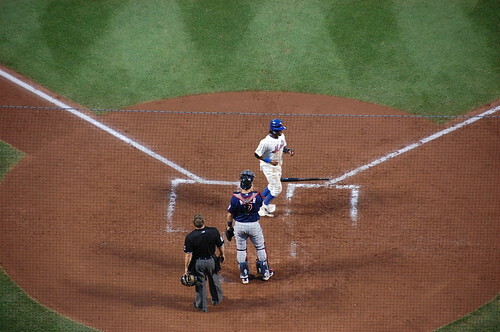 Jose Reyes got on base. 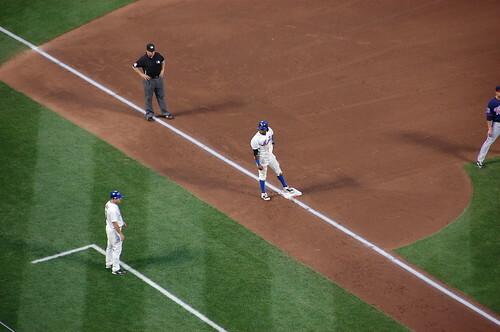 Then Jose Reyes, in high socks, reached second on a throwing error. A dirt covered Jose Reyes got to third on Jesus Feliciano’s sacrifice bunt. “Kind of,” was the response. 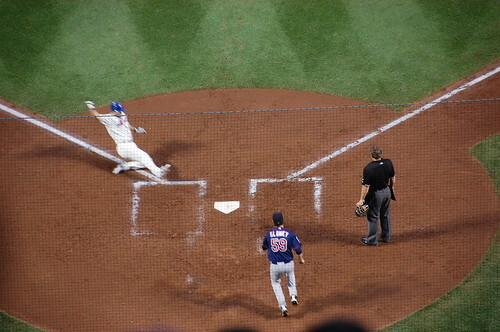 And then, here was David Wright. David Wright the unclutch, David Wright the useless (all according to the masses recently), David Wright the STILL LOSING TO PLACIDO POLANCO IN ALL STAR VOTING… who brings in Jose, and gets us on the board, and comes in later thanks to Ike Davis. And then even Jason Bay was productive!! “WE DISLIKE IKE! WE DISLIKE IKE!” was the highly respectable response. Pelf, our Big Pelf, did not quite have it tonight. The pitch count was far, far too high. It was the Twins, as previously stated, I know. 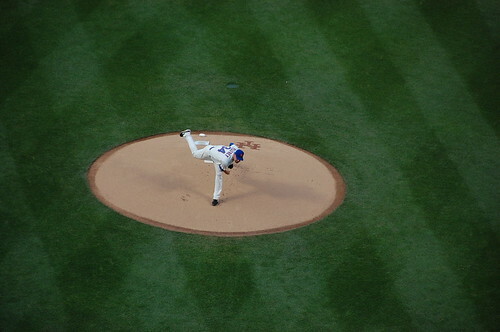 It wasn’t his most stellar performance but there were some nice pitches in there. There were outs that may not have been out, baserunners who may have been close, in short, just like any other baseball game you’ve ever been to. 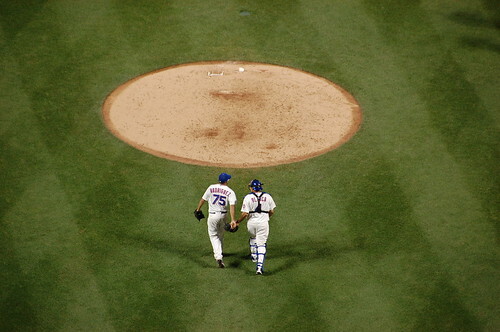 But this was the slowly battling, not-giving-up 2010 Mets. I keep waiting for something to happen that takes the wind out of everybody’s sails but even Angel Pagan and Rod Barajas being out of the lineup doesn’t tank things. (Don’t laugh, that would have tanked us last year.) You want to believe, but you know you might get burned if you believe. But belief is alive and well in Flushing right now. At least, it’s alive until Francisco Rodriguez walks on the field. Ah, Frankie. I am beginning to believe that “Francisco” really means “heart attack” or “giving me extra gray hair” or even “drama queen”. No seriously. I still don’t know what happened that made Jerry and Ray Ramirez run onto the field, but jeez louise, it was bad enough that we had men on base at that point, now Frankie might be HURT? But in the end, you know, it was fine. Frankie points to the sky, Frankie hugs Josh Thole, and it’s another home win. The Tigers couldn’t come through tonight and the Blue Jays rolled over and played dead (I know, the “home” game [what bs] in Philly, I know, Halladay, I know), so tonight was not the night. I am sorry we are missing Santana tomorrow, but I will be on a plane. Please cheer extra loudly for me.